Goldman Sachs’answer to the market: zero trading loss days in a quarter! Goldman Sachs Group Inc.’s traders made money every single day of the first quarter, a feat the firm has never accomplished before. Daily trading net revenue was $25 million or higher in all of the first quarter’s 63 trading days, New York-based Goldman Sachs reported in a filing with the U.S. Securities and Exchange Commission today. The firm reaped more than $100 million on 35 of the days, or more than half the time. 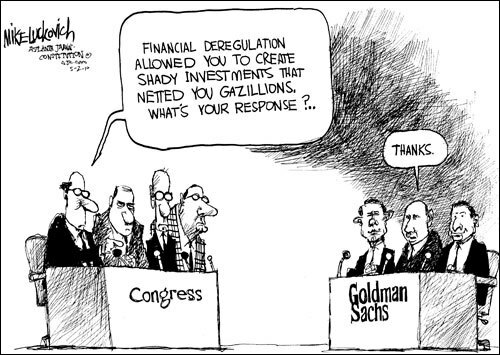 Goldman Sachs, which is facing a fraud lawsuit from the SEC related to the sale of a mortgage-linked security in 2007, generated $9.74 billion in trading revenue in the first quarter, exceeding all of its Wall Street competitors. Trading accounted for 76 percent of first-quarter revenue. The lack of trading losses could add to the perception that Goldman Sachs has an unfair advantage in the markets, said one shareholder. Ciocca echoed that view, saying he thinks the performance proves the strength of the firm’s risk-management models and its ability to make money even in markets with low volatility.